Description: Following UP 7086 with it's train of coal empties, UP 7100 Another ''Brand New And Out Of The Box'' GE AC4400 heads for Provo with it's train of coal empties out of Geneva Steel. Description: Interesting find on 37Q. Description: UP 7100 waits to finish bringing a coal train over the Mississippi River as a truck passes beneath. Description: UP 7100 swings into Berea. Description: UP 7100 leads a coal bucket bound for Paducah KY. Description: Union Pacific's MNYRO heads out of Provo with a 143 car train. Title: UP 7100 Dpu on a empty coal train. 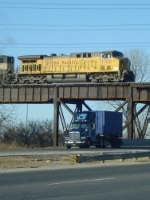 Title: UP 7100 Heads up a WB frac sand train over the Up bridge. Description: Union Pacific AC4400CW #7100 trails on a unit coal train as it passes through Martinez. The unit in front of 7100 is AC4460CW #7060.